What Does Obama Truly Want to Accomplish With His Health Care Plan? By nature, Man is born free and independent. But to live in a state of nature alone is not safe and offers no security. Hence, Man created government for his or her protection and to achieve maximum happiness. Under a constitutional republican form of government, Man delegates to that government limited powers to best achieve that protection. What rights and powers Man does not delegate to that government are his or her to exercise to his or her best advantage in the pursuit of his or her happiness. Let us examine the liberties which the People have retained and enjoyed since the Founding of the Constitutional Republic. 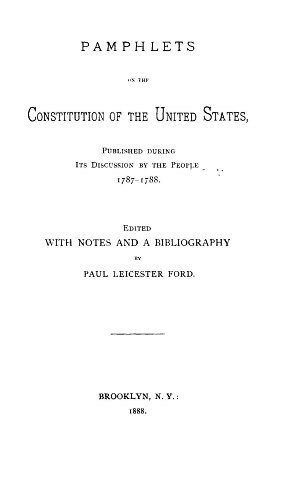 Pamphlets on the Constitution of the United States, Published During Its Discussion by the People 1787-1788, Address By Melancthon Smith p. 94 (Paul Leicester Ford ed. 1888). Melancthon Smith of New York, was a member of the Continental Congress, (1785–88), and of the New York State Convention, in which he opposed, but ultimately voted for the ratification of the new Constitution. He helped reconcile Federalists and anti-Federalists, enabling New York state to ratify the US Constitution in the Dutchess County Courthouse in Poughkeepsie on July 26, 1788. “It is true, many individuals labour under embarrassments, but these are to be imputed to the unavoidable circumstances of things, rather than to any defect in our governments. We have just emerged from a long and expensive war. During its existence few people were in a situation to increase their fortunes, but many to diminish them. Debts contracted before the war were left unpaid  while it existed, and these were left a burden too heavy to be borne at the commencement of peace. Add to these, that when the war was over, too many of us, instead of reassuming our old habits of frugality, and industry, by which alone every country must be placed in a prosperous condition, took up the profuse use of foreign commodities. The couutry [sic] was deluged with articles imported from abroad, and the cash of the country has been sent to pay for them, and still left us labouring under the weight of a huge debt to persons abroad. These are the true sources to which we are to trace all the private difficulties of individuals: But will a new government relieve you from these? The advocates for it have not yet told you how it will do it—And I will venture to pronounce, that there is but one way in which it can be effected, and that is by industry and economy; limit your expences within your earnings; sell more than you buy, and everything will be well on this score. Your present condition is such as is common to take place after the conclusion of a war. Those who can remember our situation after the termination of the war preceding the last, will recollect that our condition was similar to the present, but time and industry soon recovered us from it. Money was scare [sic], the produce of the country much lower than it has been since the peace, and many individuals were extremely embarrassed with debts; and this happened although we did not experience the ravages, desolations, and loss of property, that were suffered during the late war.” Melancthon Smith at 95. Indeed, if health care shall be the social problem upon which we are obliged to act, then let us act upon that problem alone and not allow the central government under the guise of curing that “evil” to intrude upon so many cherished liberties of the people. Why are we to give to the central government so much power and control over our private lives and industry in the name of health care? Can the central government not offer a more limited and balanced plan which would address the very concerns it expresses without intruding so much upon our liberties? We Americans are a wise and practical people. I cannot imagine that we cannot put together a plan that would address our current health care problems without the need of the central government taking over so much of our private lives and industry and forcing employers and individuals to purchase health insurance under circumstances dictated by the central government or face various forms of punishments. The danger with such government encroachment upon our individual liberties is that “history affords us no examples of persons once possessed of power resigning it willingly.” Melancthon Smith at 100. That Obama has not even tried to develop a much more limited and reasonable approach to the health care problem should tell a cautious and prudent person that his plan is not one of only solving the problem of health care, but rather one of taking advantage of a moment in history to gain power and control over private lives and industry and thereby achieve his grand plan of “redistribution of wealth” and slowly but eventually transform our free enterprise system into a government-controlled socialist/communist/Marxist way of life. Some might wonder what does health care and the “natural born Citizen” clause have to do with each other. The answer is the survival of our Constitution and Republic by stopping the usurpation of government power. In the context of speaking about slavery that existed during the Founding era, Obama told us that the Constitution is an “imperfect document.” It has now become apparent that the flaw that Obama sees with our governing document is much more fundamental and goes well beyond what he said related to the early slave experience. For Obama, that flaw is that the Constitution is obligatory, is a strong check on government power, and cannot be changed by just one person. Such conduct by Obama lead many to ask if Obama does not respect and defend the Constitution and so publicly defies it once, what will stop him from doing the same a second and third time. These Americans were right in expressing such concern, for now we have Obamacare which is just another example of Obama flouting and ignoring the Constitution. Now he wants to force upon the nation a health care system under the guise that the Federal Government can do so because that system does nothing more than regulate interstate commerce. Additionally, he wants to accomplish his plan without even adhering to legitimate legislative process. How he can honestly believe that a person who does not buy a good or service (such as health insurance) or who the government compels to do so under the threat of a camouflaged income tax is engaged in interstate commerce or gives the government the right to interfere in such personal decisions based on some other constitutional provision defies reason and common sense. Treating people’s refusal to buy health insurance as interstate commerce or triggering some other constitutional governmental power would in effect give Congress unlimited authority to control every aspect of people’s lives. When something defies logic, we have to ask ourselves what is the real motive involved. Upon close circumspection we can see that Obama’s health care plan is nothing more than the government taking more money from productive members of society and giving it to those who need money but do not have it for various reasons, with the central government in the process usurping great powers and control over the people’s lives including but not limited to violating their privacy rights over their own bodies, their medical and financial privacy, their right to decide how much medical care one needs, their right to free speech and association, their right to exercise their religion, doctors’ right to earn a living as they see fit, their right not to be illegally taxed, and their right to make end-of-life decisions. This is nothing but Obama and his Congress declaring a socialist revolution upon the American people and attempting to sneak that revolution right by them by dressing the wolf in sheep’s clothing. “MODERATOR: Good morning and welcome to Odyssey on WBEZ Chicago 91.5 FM and we’re joined by Barack Obama who is Illinois State Senator from the 13th district and senior lecturer in the law school at the University of Chicago. “OBAMA: If you look at the victories and failures of the civil rights movement and its litigation strategy in the court, I think where it succeeded was to vest formal rights in previously dispossessed peoples. So that I would now have the right to vote, I would now be able to sit at the lunch counter and order and as long as I could pay for it I’d be okay. We can see that Obama does not accept that the Tenth Amendment says that whatever powers the Constitution does not give to the federal government or prohibit to the States is reserved to the States or the people. What is it that Obama wants the government to do “on your behalf?” One can only wonder why Obama believes that a government must do some unspecified thing for people. Is it love of power and control over people that compels him to harbor such ideas? We can see that Obama realizes that my right to sit at the lunch counter is freedom “as long as I could pay for it.” Hence, comes his plan to redistribute wealth. Obama admits that such radical change has not yet been accomplished through the courts. He also does not accept the “essential constraints” the Founders and Framers wrote into the Constitution. Hence, he offers a plan on how to get around those limitations. He tells us that such radical change must be accomplished through “political and community organizing and activities on the ground that are able to put together the actual coalitions of power through which you bring about redistributed change.” So there you have it very loud and clear. Obama admits that the Constitution does not allow him to engage in any such “redistribution of wealth” and that the Courts have never gone as far to permit it. But his plan is to accomplish it by changing the political structure of America which would give him the power to accomplish what is currently unconstitutional. Obama’s fear of the courts is evidenced from provisions that provide that no company can sue the government for price fixing and there will be no judicial review of government monopoly of health care. Of course, Obama’s plan necessarily includes also changing the current make-up of our courts. Maybe this is the “change” that he had in mind when he said that if he won the Presidency he was going to “change” America. Obama has totally ignored the Constitution’s eligibility requirements for the highest and most powerful office in the land, the President and Commander in Chief of the Military. The problem with that violation is that we have a person sitting in the President’s and Commander’s seat who is not eligible to be there. Practically speaking, that is a grave national security matter that puts America at risk not only from attack from enemies both foreign and domestic but as we can see also threatens America’s basic political institutions and freedoms. 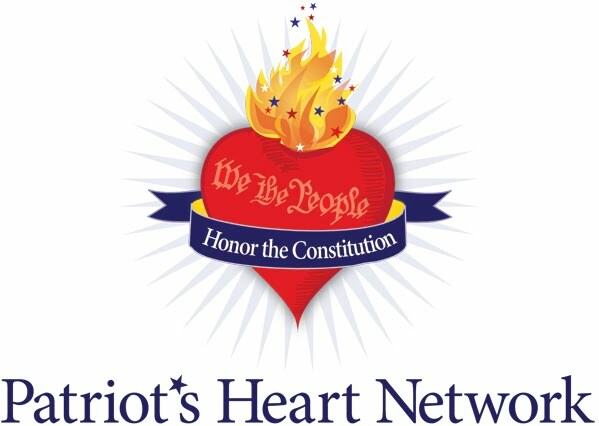 I believe it is a fair question to ask whether we would have an attack on America’s fundamental political, social, and economic institutions from a President who was a “natural born Citizen?” The Founders and Framers included the “natural born Citizen” clause in the Constitution believing that it would give America a better chance of avoiding such a person coming to power. The remedy for such usurpation is to immediately remove Obama from office and to secure that office with a replacement, all consistent with constitutional procedure. Practically speaking, such usurpation is a government attempt at nationalizing over one-sixth (and probably even more once we learn by experience what the full impact of his plan really is) of the private economy. Add to that government ownership of some banks, auto makers, and insurance companies, and we have a very serious assault upon the free enterprise system and the American way of life. Thomas Jefferson told us that “[w]hensoever the General Government assumes undelegated powers, its acts are unauthoritative, void, and of no force” and that "nullification of the act is the rightful remedy." Thomas Jefferson, November 16, 1798, Kentucky Resolution at http://memory.loc.gov/cgi-bin/query/r?ammem/mtj:@field(DOCID+@lit(tj080201)). Jefferson also warned against construing the "necessary and proper" clause so broadly as to justify the assumption of undelegated powers by the general government. He said that the intent of the clause was to only enable the execution of limited powers, not to indefinitely extend the general government's scope. If a broader interpretation were to be given to the clause, this part of the Constitution would be used "to destroy the whole residue of that instrument." Jefferson also counseled the states to be vigilant against violations of the Constitution and not hesitant to attack unconstitutional measures by Congress or the President. He continued: "[F]ree government is founded in jealously and not in confidence" and therefore urged that "no more be heard of confidence in man, but bind him down from mischief by the chains of the Constitution." In other words, the states and the People should not trust federal officials with non-constitutional powers simply because those officials might be otherwise trusted to exercise those powers benevolently. He warned that this kind of "confidence of man" leads to the destruction of free government. The next question we should ask ourselves is what other assaults upon the Constitution can we expect from Obama and his Congress? Let us keep open our ears and eyes. Let our great States follow Jefferson’s wisdom and protect our freedoms. The Kerchner et al. v. Obama & Congress et al. case, which challenges both Obama and Congress over Obama having usurped the Office of President and Commander in Chief, is currently pending in the Third Circuit Court of Appeals in Philadelphia and is awaiting the Court’s decision on plaintiffs’ request for oral argument. Many States and private persons have recently filed lawsuits over Obama’s new national health care plan. It is hoped that the People closely monitor the progress of these law suits as they make their way through the courts and that they make themselves publicly heard on the matter. This leads me to my final point. We the People need to understand that Obama will surely attempt to change the composition of or influence our judicial branch of government so that he can accomplish his unconstitutional ends. Now we can clearly see how important judicial appointments and an independent judiciary are to the survival of our Constitution and Republic and the freedoms we individuals all enjoy. I will be posting more essays on natural law, the law of nations, Emer de Vattel, the Founders and Framers, the Courts, and the meaning of the "natural born Citizen" clause. Is the State of Hawaii Covering Up Birth Registration Fraud in the Case of Obama? Hawaii Law Makers Contemplating Stopping Concerned Americans from Investigating Whether Obama Was Born There. A Catalog of Evidence for and Against Obama's Physically Being Born in Hawaii and Not Just Falsely Registered There After the Fact. The State of Hawaii is contemplating passing a law allowing its officials not to answer the requests of concerned Americans who are looking for proof from that State that putative President Barack Obama was born there as he claims. Officials there contend that many of the open records requests are repetitive and vexatious and they cause them to lose time and money in providing a response to others. We hope that the State of Hawaii will consider the state of affairs as they exist today regarding the question of whether Obama was born in Hawaii. It is probably these circumstances which causes concerned Americans to continue to pursue the State for a definitive answer. Let us review what we know. Was Obama born in Hawaii? What is the evidence for and against? (13) There exists a birth announcement in two local Honolulu newspapers printed in August 1961 (but these announcements alone do not prove that Obama was born in Honolulu. See No. 20 below). (18) Hawaii Health Department has publicly released incomplete and inconclusive information which Obama supporters claim shows that Obama was born in Honolulu. Anyone who is only relying on the fact that Hawaii officials do not say that Obama was born in any place other than Hawaii is missing the point which is what sufficient and credible proof exists that Obama was born in Hawaii. We do not know what evidence Hawaii is relying on to simply say that he was born in Hawaii. If the underlying root "evidence" is fraudulent, then anything Hawaii says is of no value and surely not evidence that Obama was in fact born in Hawaii. In other words, in such a case, Hawaii would be picking fruit from a poisonous tree. Section 338-5 of the Hawaiian statute provides: "§338-5 Compulsory registration of births. Within the time prescribed by the department of health, a certificate of every birth shall be substantially completed and filed with the local agent of the department in the district in which the birth occurred, by the administrator or designated representative of the birthing facility, or physician, or midwife, or other legally authorized person in attendance at the birth; or if not so attended, by one of the parents. The birth facility shall make available to the department appropriate medical records for the purpose of monitoring compliance with the provisions of this chapter. [L 1949, c 327, §9; RL 1955, §57-8; am L Sp 1959 2d, c 1, §19; HRS §338-5; am L 1988, c 149, §1]." Obama alleges he was born in Kapi'olani Medical Center. At no time during the ongoing public debate about whether Obama was born in Hawaii has any official from Hawaii at least informed the pubic that Obama's alleged vital records show that his birth certificate from 1961 was "completed and filed" with the health department in Honolulu by some official of that hospital or a physician or midwife associated with that institution. If Obama was born in a hospital as he claims, we cannot reasonably believe that his birth certificate would have been completed and filed by one of his parents. Additionally, under this statute, Hawaii has the power and authority to obtain medical records from Kapi'olani Medical Center to confirm Obama's alleged Hawaiian birth. At no time did Hawaii inform the American public that it in fact confirmed with that hospital that Obama was in fact born there which it can do under the cited statute. Hawaii has withheld this underlying evidence from the public. This withholding of evidence is a grave matter given that there exists such reasonable doubt as to whether Obama, the putative President and Commander in Chief of our military might, was in fact born in Hawaii. We will know what the underlying evidence is about Obama's alleged birth in Hawaii only if we can examine Obama's contemporaneous birth certificate from 1961 which is readily available since Obama claims he was born in Kapi'olani Medical Center in 1961. That root document will tell us the name of the hospital in which he was born and the name of the doctor or midwife who delivered him. Those pieces of information are highly corroborative of the place and time of birth, for they provide a whole other dimension of contemporaneous facts that would support Hawaii's or anybody else's bare statement as to the place and time of Obama's birth. (21) The proffered online image of the Certification of Live Birth (COLB) put on the internet states in the lower left corner a date of "Filing" the birth registration. It does not state that the birth registration was "Accepted." Computer generated COLBs obtained for other people registered in Hawaii have the word and date "Accepted" in that field. See these examples compared to Obama's COLB. This implies the birth registration was never finally accepted and that additional information on the birth registration was requested by the state but never received. 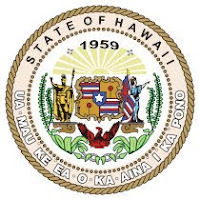 If the state questioned the evidence in 1961 provided by the family to register the birth as occurring in Hawaii, that is all the more reason now to investigate the birth registration method and statements provided to the Health Department by the family back in 1961. 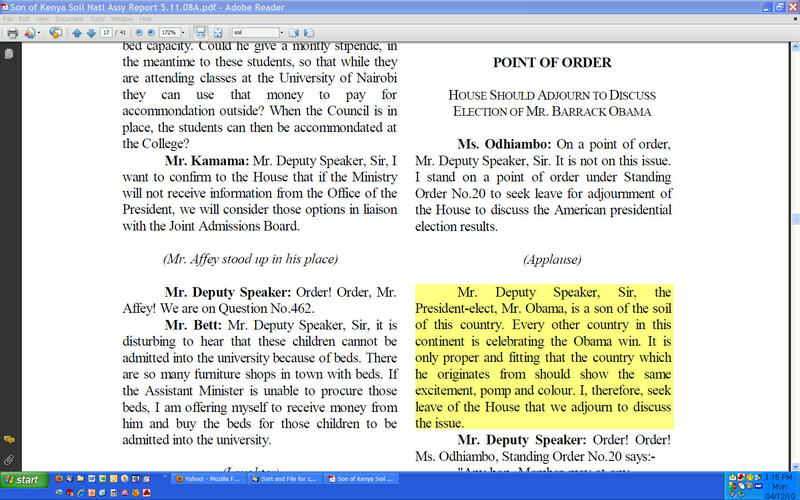 What evidence was missing such that the registration was never "Accepted;"
(27) Another Kenyan Minister on April 14, 2010, made a statement about Obama's origins and says that Obama should repatriate himself to Kenya. "What commitment did they make about compensation and more importantly, the biggest artefact [sic] in the USA today that belongs to this country is one Barrack Obama. How does he intend to repatriate himself or part of the money that is realized from all the royalties that he is attracting across the whole world?" Kenyan Minister Khalwale Asks When Obama Will Repatriate Himself @ Jefferson's Rebels http://jeffersonsrebels.blogspot.com/2010/04/kenyan-minister-khalwale-asks-when.html. None of these factors alone would be sufficient to disprove that Obama was born in Hawaii. But the totality of them raises legitimate doubts which Obama should dispel by providing corroborating evidence supporting his claim that he was born in Hawaii. 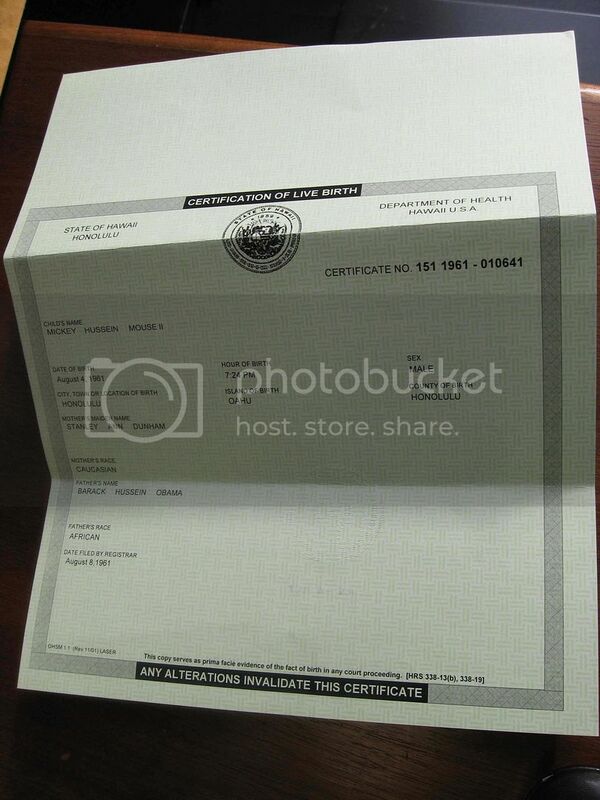 That evidence must be more than just posting a computer image of an alleged 2008 COLB which at best is only prima facie evidence that he was born in Hawaii, for it does not contain the name of the birth hospital in Honolulu or of the delivering doctor there or other corroborating evidence. Given America’s military might and who her current enemies are, Americans know that an attack upon America will most likely not come from without but rather from within. They also know the amount of power that the President and Commander in Chief of the Military wields and how that power affects their lives every day. Given these circumstances, it should not be difficult to understand why Americans, concerned for their life, liberty, safety, security, tranquility, and property, want to protect themselves by making sure that their President and Commander in Chief was born in Hawaii as he claims he was and that he is a “natural born Citizen” to whom they can entrust their very lives. It is Obama who chose to run for President. We cannot imagine that he does not realize that he has no reasonable expectation of privacy as to his place of birth and as to what he has done in his life. Regardless of where Obama was born, he has lost what he probably perceives to be nothing more than a little birth certificate game given that he has disrespected so many Americans who have every right to know who their President is. Obama is supposed to be a constitutional scholar. Maybe he never learned or he forgot that the President works for and answers to the people who under our Constitutional Republic are the sovereigns. We hope that Hawaii can understand the frustrations that these concerned Americans feel when they turn to that state for confirmation regarding Obama’s place of birth which Obama himself could easily provide. Obama’s refusal to provide basic credible information showing where he was born can only leave us thinking what is Obama hiding. A comment about the Hawaiian birth certification issue by Commander Kerchner: Birth certificate registration fraud is more common than people realize. Here is an example of how people born in other countries were being falsely registered as born in the USA. 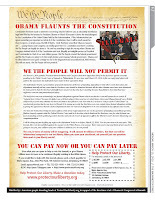 Commander Kerchner makes a statement in this new ad concerning what he believes was an absolutely incredulously lame legal brief filed by the Department of Justice (DOJ) lawyers for the putative president Obama on March 8th because it shows the total disregard for the Constitution of the United States held by the Administration and his subverted Department of Justice. The DOJ should be standing up to support and defend the U.S. Constitution and honor the oath they took to do so, instead of defending the constitutionally ineligible usurper putative president in the Oval Office, Mr. Obama, and helping him hide his true legal identity and all his early life records. Obama was born a British Subject. How can a person born British be eligible to be President and commander of our military? He cannot. A person born a British Subject, and a dual-Citizen at best, is NOT a "natural born Citizen" of the USA which is the Article II eligibility requirement in the U.S. Constitution for the person who would be President. See the new ad for more information. ~The defendant's (Obama & Congress et al) Opposition Brief recently filed with the U.S. 3rd Circuit Court of Appeals in Philadelphia PA for the Kerchner et al v Obama & Congress et al lawsuit and the forthcoming appellant's (Kerchner et al) Reply Brief. ~Other topics and questions by the host and/or from the listening audience call-ins. Today, March 8, 2010, putative President Barack Obama and Congress filed their Opposition Brief to the Kerchner appeal currently pending in the Third Circuit Court of Appeals in Philadelphia. The brief may be viewed at this link. We now have until March 22, 2010, to file our reply brief which will address the arguments the defendants have made in their opposition brief. The defendants' brief is a presentation of general statements of the law of standing. Appealing to what other courts have done, the defendants basically tell the court that the Kerchner case should be dismissed because all the other Obama cases have been dismissed. Its main point is that the Kerchner plaintiffs have not proven that they have standing because they failed to show that they have suffered a concrete and particularized injury. The brief does not even acknowledge our factual allegations against Obama which are that he is not and cannot be an Article II “natural born Citizen” because his father was a British subject/citizen and not a United States citizen and Obama himself was a British subject/citizen at the time Obama was born and that he has failed to even show that he is at least a “citizen of the United States” by conclusively proving that he was born in Hawaii. It is strange as to why the brief does not even contain these factual allegations within it, giving the appearance that the Justice Department does not want such allegations to be even included in any official court record. Nor does the brief acknowledge let alone address what all our legal arguments are on the questions of standing and political question. Rather, it merely repeats what the Federal District Court said in its decision which dismissed the Kerchner case for what it found was lack of standing and the political question doctrine and asks the Court of Appeals to affirm the District Court’s decision dismissing our complaint/petition. 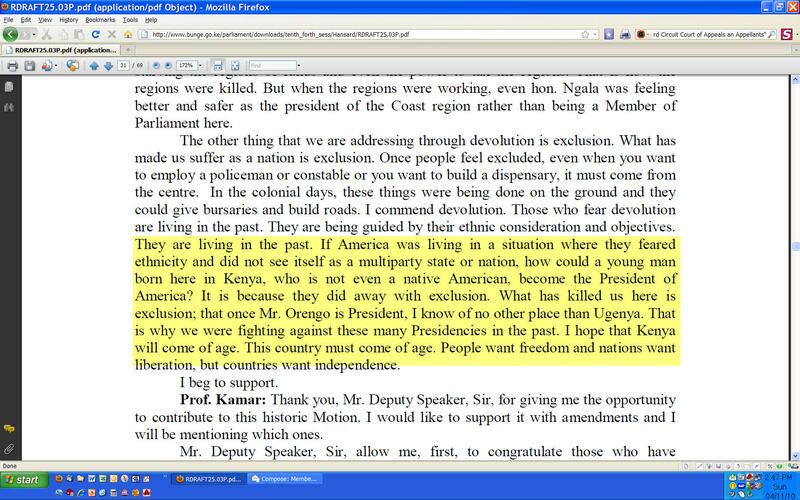 I will be filing my reply to the defendants’ brief on or before March 22, 2010. Most probably recognize that United States citizens are created either at birth or at the moment of naturalization. The former is a native (using that term in its modern sense and not in the sense that the Founders used it) and the latter is not. Most probably also recognize that a naturalized citizen is not eligible to be President. But what many fail to recognize is that the event of birth has two natural elements which always have and always will be present in every birth: (1) the place where one was born and (2) the two parents who procreated the child. Hence, some also fail to understand that there are two types of born citizens, one being a born "Citizen of the United States" and the other being a "natural born Citizen." Under current law, a born "Citizen of the United States" is one granted that status under the 14th Amendment or Congressional Act (e.g. Title 8 Section 1401), both of which consider either (1) being born on United States soil or (2) being born to at least one United States citizen parent sufficient conditions for being granted the status of a born "Citizen of the United States." Never in our history has the United States Supreme Court or the Congress ever required that one needs to satisfy both of these conditions in order to be a “citizen of the United States.” But as to a “natural born Citizen,” we have a different story. To understand what an Article II “natural born Citizen” is, we have to revert to the Founding era to determine what the Founders and Framers intended that clause to mean. 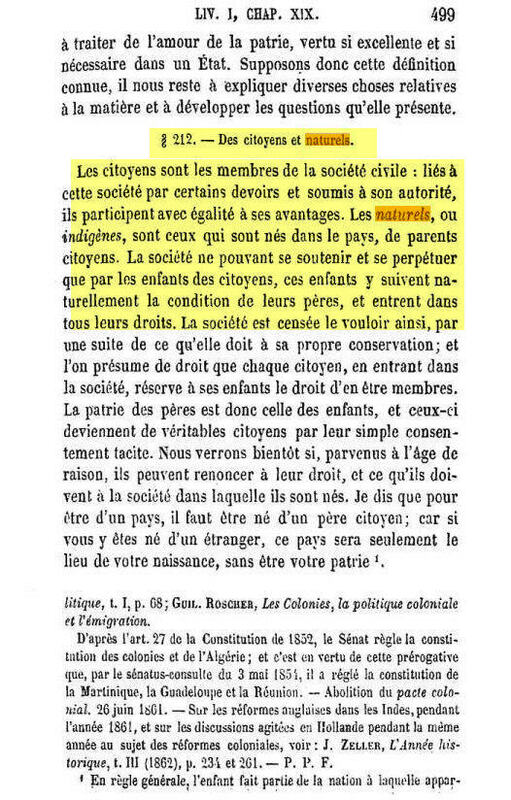 In analyzing what meaning the Framer’s gave to the “natural born Citizen” clause, we must remember that they wrote the Constitution in the historical context of having won a Revolution and in having to constitute a new society. They were inspired by and found justification in the political philosophy of natural law and the law of nations and not that of the English common law in going forward with that Revolution and they relied on that same law when defining national citizenship. Article II, Section 1, Clause 5 of the Constitution grandfathered all persons to be eligible to be President who were “Citizens of the United States” at the time the Constitution was adopted. These persons would have been adults who were born in the colonies, children born in the new states, or adults inhabiting or naturalized under the naturalization laws in either place, at the time that the Constitution was adopted, provided they all adhered to the American Revolution. Justice Gray in United States v. Wong Kim Ark, 169 U.S. 649 (1898) explained that under English common law that prevailed in the colonies these original citizens included persons who were born in the colonies or new states to alien parents. These original citizens, whether born in the country or out of it, were all naturalized to be “citizens of the United States” by simply adhering to the American Revolution. The Founders in Article II grandfathered these “citizens of the United States” to be eligible to be President, provided that they were such at the time of the adoption of the Constitution which we know occurred on September 17, 1787. The grandfather clause is obsolete today. The Founders themselves, being born prior to independence were subjects of the British Crown and to other foreign sovereigns but adhering to the American Revolution became part of the first “citizens of the United States.” All being born in the colonies before the Declaration of Independence was adopted in 1776 to British parents, the first seven Presidents were born subjects of Great Britain (born subject to a foreign power) and therefore needed the grandfather clause to make them eligible to be President. William Harrison, the ninth President, born in 1773 in Virginia, was the last President who could utilize the grandfather clause to make him eligible to be President. Justice Story observed in his Commentaries on the Constitution of the United States that for the Framers to allow naturalized citizens (who like them were born subject to a foreign power and as we shall see below not “natural born Citizens”) to be eligible to be President was an exception to “the great fundamental policy of all governments, to exclude foreign influence from their executive councils and duties.” III J. Story, Commentaries on the Constitution of the United States Sec. 1473 (1833). Being born on December 5, 1782, on United States soil (in New York and therefore not born on foreign soil) to parents who had also become “citizens of the United States” by election to be loyal to the American Revolution (not born to foreign parents), Martin Van Buren, the eighth President (his mother was of Dutch ancestry and his great-great-great-great-grandfather Cornelis had come to the New World in 1631 from the Netherlands) was the first United States President not born a British or other foreign subject (not subject to a foreign power by being born either on foreign soil or to a foreign parent) who was born a “natural born Citizen” and who therefore did not need the grandfather clause to make him eligible to be President. The New Netherland Institute describes Van Buren’s family history as follows: “In fact, although they were fifth generation Dutch, all of their forebears were of Dutch extraction. The original Van Buren had come over in the 1640's during the Van Rensselaer era when all of Columbia County was part of the Rensselaer Estate. And the original immigrant forbear probably came over sponsored by Killian Van Rensselaer, among many other immigrants, to occupy the Rensselaer estate. As a result Martin Van Buren was pure Dutch, and still spoke Dutch, the language that prevailed for many generations in that part of New York State along the Hudson River.” http://www.nnp.org/nni/Publications/Dutch-American/buren.html. It has been said that Van Buren is the first President born under the American flag. 1. Samuel von Pufendorf, The Whole Duty of Man According to the Laws of Nature (William Tooke trans., Ian Hunter & David Saunders, eds., Liberty Fund 2003, Book II, Chapter 6, xiii (1691): “Citizens are either Originally so; that is, such as are born in the Place, and upon that Account claim their Privileges; Or else, Adscititious; that is, such as come from Foreign Parts. Of the first Sort, are either those who at first were present and concerned in the forming of the said Society, or their Descendants, who we call Indigenes, or Natives. Of the other Sort are those who come from Foreign Parts in order to settle themselves there. As for those who come thither only to make a short Stay, although they are for that Time subject to the Laws of the Place; nevertheless, they are not looked upon as Citizens, but are called Strangers or Sojourners." Hence, Quintilianus’ work which was translated from the Latin to the English provided the clause “natural born citizen” and the word “native” and the translators used the words interchangeably to mean the same thing. This fluctuation in translation explains why the Founders, too, used the words “native” and “natural born Citizen” synonymously. 3. 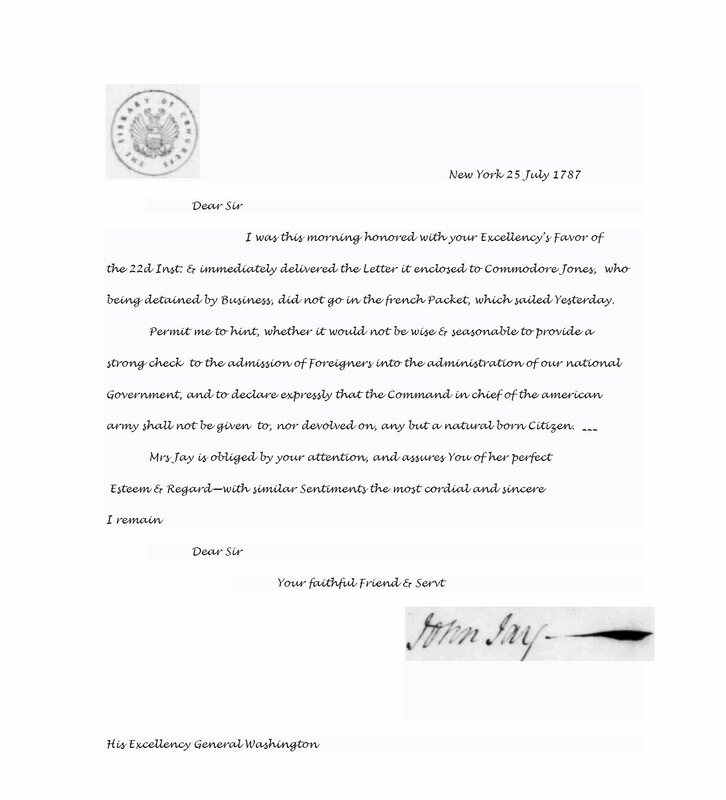 Rutgers v. Waddington (1784): In 1784, Alexander Hamilton, as the lawyer for the defense, arguing in the case of Rutgers v. Waddington, quoted prolifically from Vattel’s, The Law of Nations. The Waddington case shows how Vattel shaped Hamilton’s thinking. Hamilton argued that the law of nations was part of the common law and that the decisions of the New York Legislature must be consistent with the law of nations. Hamilton used Vattel as the standard for defining the law of nations. Hamilton argued that state law was superseded by national law and the law of nations. He also argued that the intent of the state legislature had to be that their laws be applied in a fashion that was consistent with national law and the law of nations. Judge James Duane in his ruling described the importance of the new republic abiding by the law of nations, and explained that the standard for the court would be Vattel. He ruled that the New York statue passed under the color of English common law must be consistent with the law of nations. Hamilton espoused a concept of constitutional law which he obtained from the teachings of Vattel. It was Vattel that gave him the idea of the judicial branch of government making sure that both the legislative and executive branches follow the Constitution. It was Hamilton’s views on Vattel that lead to the creation of judicial review which was included into the Constitution and which was later given prominence by Chief Justice John Marshall. It was Vattel’s idea of what the purpose of government should be (promote commerce, revenue, agriculture, tranquility, happiness, stability, and strength) that Hamilton advocated to the convention delegates in 1787. 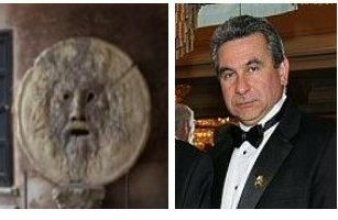 Hence, there is no doubt that Vattel shaped the founding of the United States. 6. Dred Scott v. Sandford, 60 U.S. 393 (1857): Justice Daniel concurring, cited and quoted from Vattel and The Law of Nations thus: "'The citizens are the members of the civil society; bound to this society by certain duties, and subject to its authority, they equally participate in its advantages. The natives, or natural-born citizens, are those born in the country, of parents who are citizens. As society cannot perpetuate itself otherwise than by the children of the citizens, those children naturally follow the condition of their parents, and succeed to all their rights.' Again: 'I say, to be of the country, it is necessary to be born of a person who is a citizen; for if he be born there of a foreigner, it will be only the place of his birth, and not his country. . . .'" It should be noted that Justice Daniel took out of Vattel’s definition the reference to “fathers” and “father” and replaced it with “parents” and “person,” respectively. I have maintained that the Founders and Framers relied upon natural law and the law of nations rather than the English common law to define a "natural born Citizen." On the question of whether blacks were citizens, Justice Curtis in dissent looked to the law of nations to determine their status given that there was no other municipal law that had abrogated that law. He did not look to the English common law. 7. Rep. John Bingham, in the House on March 9, 1866, in commenting on the Civil Rights Act of 1866 which was the precursor to the Fourteenth Amendment: "[I] find no fault with the introductory clause [S 61 Bill], which is simply declaratory of what is written in the Constitution, that every human being born within the jurisdiction of the United States of parents not owing allegiance to any foreign sovereignty is, in the language of your Constitution itself, a natural born citizen. . . . ” Cong. Globe, 39th, 1st Session, 1291 (1866). 9. Minor v. Happersett, 88 U.S. 162, 167-68 (1875): “The Constitution does not in words say who shall be natural-born citizens. Resort must be had elsewhere to ascertain that. At common law, with the nomenclature of which the framers of the Constitution were familiar, it was never doubted that all children born in a country of parents who were its citizens became themselves, upon their birth, citizens also. These were natives or natural-born citizens, as distinguished from aliens or foreigners. Some authorities go further and include as citizens children born within the jurisdiction without reference to the citizenship of their parents. As to this class there have been doubts, but never as to the first. For the purposes of this case, it is not necessary to solve these doubts. It is sufficient, for everything we have now to consider, that all children, born of citizen parents within the jurisdiction, are themselves citizens.” Id., 169 U.S. at 679-80. 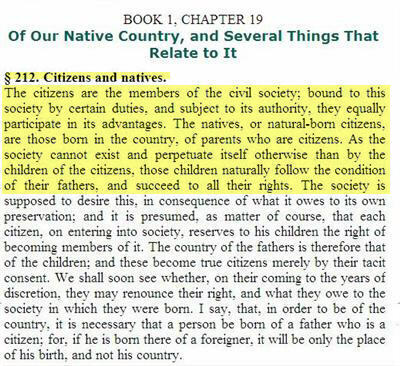 Minor did not cite Vattel but as can be seen the Court’s definition of a “citizen” and a “natural born Citizen” are taken directly out of Vattel’s Section 212. The two citizen-parent requirement (not only just one parent) comes from the definition of a “natural born Citizen” referring to the child’s parents in the plural. It also comes from the common law that provided that a woman upon marriage took the citizenship of her husband. Both parents must also be citizens in order for the child not to be born subject to any foreign power and therefore with any other conflicting allegiance or loyalty. Hence, given the Framers’ use of the “natural born Citizen” clause, they required a would-be President to have both (1) birth on United States soil (or its equivalent) and (2) birth to two United States citizen parents as necessary conditions of being granted that special status. Given the necessary conditions that must be satisfied to be granted the status, all "natural born Citizens" are "Citizens of the United States" but not all "Citizens of the United States" are "natural born Citizens." It is telling that of all the positions and offices the Framers provided for in the Constitution, only that of the President and Commander in Chief of the Military (and also the Vice President under the Twelfth Amendment) may be occupied only by a “natural born Citizen.” They therefore believed that this singular and all-powerful office was more vulnerable to foreign influence than any other and they thereby sought to give it the most protection that they could. Minor said that there were doubts whether the children born in the United States to alien parents were “citizens.” The Minor decision was decided in 1875 or 87 years after the Constitution was adopted and as Justice Waite explained in that decision our nation still had doubts on whether children born in the United States to alien parents were even citizens. If the Court had doubts about whether these children were “citizens,” it surely had doubts whether they were “natural born Citizens.” We cannot reasonably imagine that the Framers would have used a standard for a person to meet in order to be eligible to be President and Commander in Chief of the Military which would have created doubts as to its meaning and which would therefore have put at risk the security and integrity of that critically important office. Surely, they would have relied on a definition that created no doubt which Minor explained was one that included that both the child be born in the country (or its equivalent) to citizen parents. Indeed, as Minor explained, such a standard created no doubt. It was through the “natural born Citizen” clause that the Framers sought to accomplish the goal of protecting the Office of President and Commander in Chief of the Military from foreign influence and of providing a definition of national citizenship which the nation would have no difficulty to understand. The categories of citizens that the Framers established in the Constitution is "natural born Citizen" and "citizen of the United States." With respect to citizenship, the Framers gave Congress only the power to "naturalize" persons to become "citizens of the United States." Hence, any person that is made a citizen by Congress that is not by the natural circumstances of his or her birth a "natural born Citizen" is necessarily a naturalized citizen and consequently a "citizen of the United States" but not a “natural born Citizen.” Congress has also chosen to exercise its naturalization power over children born in the United States which constitutionally could have any effect only over a child who is not a "natural born Citizen." See 8 U.S.C. Sec. 1401(a) ("The following shall be nationals and citizens of the United States at birth: (a) a person born in the United States, and subject to the jurisdiction thereof;"). In Dred Scott v. Sandford, 60 U.S. 393 (1856), the United States Supreme Court said that slaves and their descendents, whether free or not, were not members of American society even though born on United States soil and unlike the American Indians subject to the jurisdiction thereof. Hence, the Court said that they were not “citizens of the United States.’ To correct that ruling, Congress passed the Civil Rights Act of 1866. With this Act, Congress first declared what a "citizen of the United States" was. The Act declared citizens of the United States “all persons born in the United States, and not subject to any foreign power, excluding Indians not taxed.” 14 Stat. 27; Rev. Stat. Sec. 1992. Hence, this Act removed from citizenship any factor related to color, race, or past condition of servitude. Because of the controversial nature of the Act, Congress saw fit to introduce and have passed a constitutional amendment which would protect what the Act sought to accomplish from the political whims of future Congresses and state governments. We know that this Act became the precursor to the Fourteenth Amendment which was passed in 1868. In Strauder v. West Virginia, 100 U.S. 303, 310, 25 L.Ed. 664 (1879), in commenting upon what the purpose of the Fourteenth Amendment was, our U.S. Supreme Court said: "Its aim was against discrimination because of race or color. As we have said more than once, its design was to protect an emancipated race, and to strike down all possible legal discriminations against those who belong to it. To quote further from 16 Wall., supra: 'In giving construction to any of these articles [amendments], it is necessary to keep the main purpose steadily in view.' 'It is so clearly a provision for that race and that emergency, that a strong case would be necessary for its application to any other.' "
The amendment was needed to remove any doubts regarding whether blacks could be United States citizens. But the amendment only allowed these slaves and their descendents to become a member of the United States community by making them United States citizens. The intent and purpose of the amendment was to provide equal citizenship to all Americans either born on United States soil or naturalized therein and subject to the jurisdiction thereof. It did not grant “natural born Citizen” status. The Amendment’s framers were familiar with how the Constitution in many places and the Naturalization Act of 1790 (used “natural born citizens”) and 1795 (changed the statute to read just “citizens of the United States”) distinguished between a “natural born citizen” and a “citizen of the United States.” If the Amendment were to grant “natural born Citizen” status, it would have told us that a born citizen thereunder was a “natural born Citizen” and not only a “citizen of the United States.” It also would not have equated a born citizen thereunder to a naturalized citizen, for a naturalized citizen is not eligible to be President. Hence, the Amendment only confers “citizen of the United States” status, as that is the exact clause used by the Amendment itself and that is the same clause that appears in Articles I, II, III, IV and Amendments Eleven, Fourteen, Fifteen, Nineteen, Twenty-Four, and Twenty-Six of the Constitution and in various Congressional Acts. It just conveys the status of “citizen of the United States,” and as we have also seen from how the First and Third Congresses handled the Naturalization Acts of 1790 and 1795, being a “citizen of the United States” does not necessarily mean that one is a “natural born Citizen.” Indeed, both Minor v. Happersett (1875) and U.S. v. Wong Kim Ark (1898) expressly told us that the meaning of a “natural born Citizen” is not found in the Fourteenth Amendment or any other part of the Constitution but rather in the common law. The Supreme Court decided these cases after we adopted the Fourteenth Amendment in 1868 and the Court in both cases was asked to decide if the subject person was a “citizen of the United States” under the Fourteenth Amendment. The Fourteenth Amendment only tells us who may become members of the community called the United States, i.e., those born on U.S. soil or naturalized and subject to the jurisdiction thereof are U.S. citizens, “and nothing more.” Minor v. Happersett, 88 U.S. 162, 166, 22 L.Ed. 627, 21 Wall. 162 (1874). The Fourteenth Amendment gave the status of "citizen of the United States" to all those persons born in the United States or naturalized therein and "subject to the jurisdiction thereof." As to born citizens, the Amendment was not needed to make anyone a "natural born Citizen," for that status was conferred upon a child by natural law and the law of nations. On the other hand, the Amendment was needed to clarify who may be a "citizen of the United States." Under the probable meaning of the Amendment, it simply removed race, color, and condition of servitude from the application of the natural law and law of nations definition of a “citizen” and a “natural born citizen.” As the “subject to the jurisdiction thereof” clause is currently interpreted, which interpretation is questionable and highly debated, the Amendment went as far as to take Congress's power to "naturalize" a child born in the United States of parents who were not citizens (one parent or both not citizens or even legal residents) as expressed by it in the 1866 Act and constitutionalized the status of that child to a "citizen of the United States." Additionally, a Fourteenth Amendment born "citizen of the United States" does not need to go through any formal naturalization process as does a person wanting to be a “citizen of the United States” but who was not born a "citizen of the United States" under any Congressional Act. This more liberal rule can be better understood when we consider that Vattel informed that England was an exception to the general rule for being born a native or indigenes, in that in England the “single circumstance of being born in the country naturalises the children of a foreigner,” Vattel, at Sec. 214. To have the special status of "natural born Citizen," a child needs to necessarily satisfy the birth conditions of that special status, i.e., born in the country to two citizen parents. These are two factors that occur naturally and need no law to be so recognized. Because “natural born Citizen” status requires unity of citizenship and allegiance, conditions which descend naturally to the child at the time of birth from the two events of birth in the United States and birth to United States citizen parents, this status provides a would-be President with the greatest degree of loyalty and allegiance to the United States, a quality that the Framers expected all Presidents and Chief Military Commanders born after the adoption of the Constitution to have. 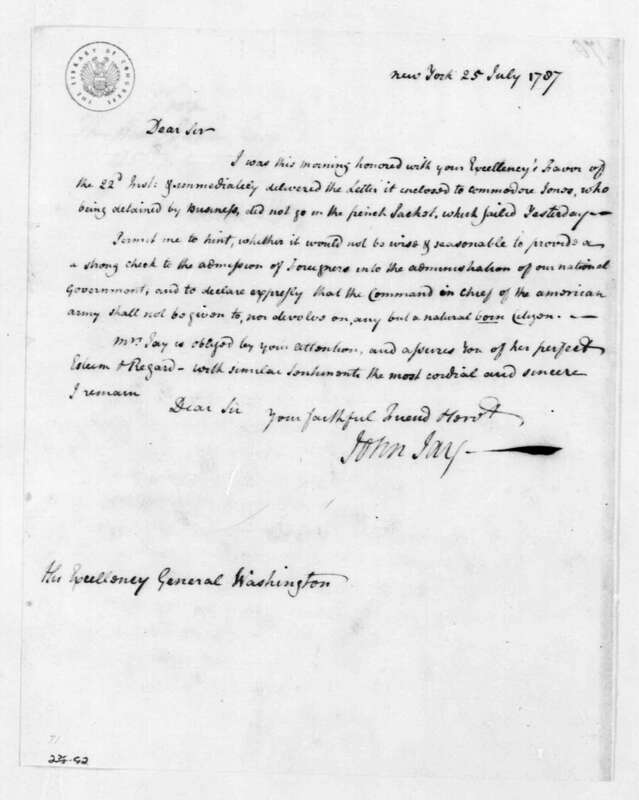 It is this high degree of loyalty and allegiance to the United States in a President and Military Commander in Chief of the Military that provides the nation and each of its citizens and residents with both the greatest confidence in the person holding that highest civil and military office and the greatest protection from enemies both foreign and domestic, or what John Jay in his letter of July 25, 1787, to then General Washington (copy of original) called “a strong check” on foreign influence invading our government. Wisdom shows that there is no sound national security or public policy reason why a Constitutional Republic such as the United States should demand anything less from a person who would aspire to the singular and all-powerful office of President and Commander in Chief of the Military. 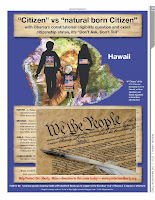 Because Obama was born 173 years after the Constitution was adopted, he cannot take advantage of Article II’s now obsolete grandfather clause which would have allowed him to be eligible to be President if he could conclusively prove that he was a “citizen of the United States” (by conclusively proving he was born in Hawaii). Since he cannot utilize the grandfather clause, he must conclusively prove he is a “natural born Citizen” to be eligible to be President. But Obama’s birth circumstances show that, even if he were born in Hawaii as he claims, he cannot satisfy his constitutional obligation under Article II. Obama’s father, being born in the then-British colony of Kenya, was under the British Nationality Act 1948 a British subject/citizen and not a United States Citizen when Obama was born in 1961. Being here only temporarily on a student visa, he was not domiciled or permanently residing in the United States. Obama himself in 1961 by descent from his father was also born a British subject/citizen under that same 1948 Act. If Obama was born in Hawaii (a fact which he has yet to conclusively prove by presenting a contemporaneous birth certificate created in 1961 when he was born and not a Certification of Live Birth created in 2007 and posted on the internet in 2008), which would make him a dual citizen from birth of the United States and Great Britain, he could qualify as a “Citizen of the United States” under a liberal and questionable interpretation of the Fourteenth Amendment. But because his father was not a United States citizen when Obama was born, he was born subject to a foreign power which he inherited from his father. Being born subject to a foreign power like a naturalized citizen, he is not an Article II “natural born Citizen” and therefore is not eligible to be President and Commander in Chief of the Military of the United States.